Since demonetization, the rate of digital transactions have increased very much. with this motive to make any india cashless, a lot of paid apps have been launched by many companies. but the number of this app is so much that people get confused, which has to install and which one do not which app is genuine, and which apps from which I would be more useful and which apps not right for you. So all of these questions get entagled in us and we cannot decide what exactly is awesome. Regardless, of whether there is an Apps of digital payments, there should be some Global futures , so before you choose payment apps you decide whether or not that particular apps has these futures. #. That app is is accepted and certified everywhere: we shop at different place in the daily life, then you have to make sure that the app you choose is accepted in most places, where you often buy we do. #. You can do all the basic task with apps recharging: through the app, paying bills, paying different merchants like basic works. It should not be that you are sending money using that app in the morning and it is approaching The Other Hostage, in the evening transactions should be instantly and in real time . #. You can transfer the balance of this app to your bank account : the balance of the apps should be the option to transfer to your bank account I personally would not like to create an account. in any app which does not have options of transferring money to my bank. Best payment apps in India. 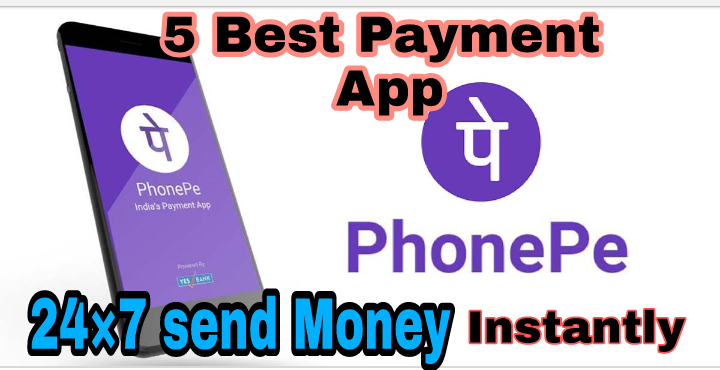 Keeping the above mentioned it things in a mind , and according to personal experience I have mentioned it 5 such payment App below, which will help you in 24 × 7 transactions while staying in India . which has been first described it briefly and then given a video so that you can understand all the future of the apps before installing it properly. This is an app that has to be closed to each other, nowadays it has become mandatory. this apps is a future that should be in an ideal payment apps. By using this app you can instantly send money to anyone at 24 × 7 real time. you can do UPI transactions. from mobile, broadband, from perfumes to online shopping you can do everything by using Paytm. Paytm is now India most popular payment appssss, and everyone offer a required services. so according to me this is a must have app. which must be installed in every one smartphones. you also get an optional future or Paytm payment Bank in which you can transfer your money and get a 7% annual interest as well . It is an authorized bank, which you can also get a debit card and with that debit card you can withdraw money from any partner ATM in your payment Bank. Phonepe Parent company is Flipkart. 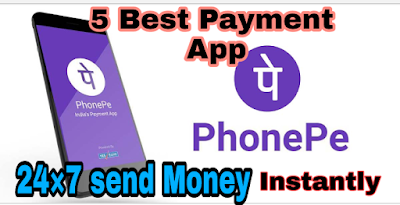 phonepe is also a very useful and full of future app like Paytm. Now phonepe will like to keep all those people install it. in their phones, will often shopping on Flipkart or on it's a partner companies website. because in this apps regular offers lots of instant cashback offers and discounts for you. From this, the app can also back directly through the UPI feature . you can also create a gift card in this app and then send and as a gift amount to anyone . the interface of this app is also very clean, simple, and great. there is a great future in phonepe, a split bill in which to locked can pay a bill half by side. now suppose you are using on a service share basic you can pay half to half one by using the future of split bill. Airtel offers and all in one app so you can do more than manage your phone balance or more. There is a second option of Airtel payment Bank . in this you can create an account, by your partial KYC. if you want you can also savings account with the same as the Paytm payment bank . but this is optional. Another great benefits to using the Airtel payment Bank payment is it also offers your Maestro prepaid debit card, with you can use on ecommerce websites around the world or any other website where the normal Maestro card is accepted. I like the future with this debit cards . you can block and unblock this card at any time. I would recommended that you normally block it and whenever you want to use it, you unblock it . just keep 1 things in mind this is a prepaid card, if you have money in your Airtel payment bank account then you can use it via card. Bhim app is an app launched by National payment Corporation of India. this was India's first you pop this was the first search application, by using which anybody can direct bank to bank transaction with the help of 24 × 7 × 365 UPI. The interface of Bhim app is very simple to look at but it is a very secure and powerful apps. if you are bank supports you cry then I would recommended that you use the Bhim app instead of using the up to be operated in individually by your bank. All of the above mentioned apps are limited to India only. if you have to send money from someone in India then Paypal is the best option. in this, you have to use your email address, create your account and how to verify with documents like PAN card . with this help you can get money from anyone around the word and can also send them. PayPal automatically transfer the money coming into your PayPal Account into a bank account. that you have linked and verified within 1 working day . Which is your favourite app for 24 × 7 payments to send and receive in India . if you know about another great have tell us through comments. To get more such informational post and to receive notifications about new blog post, please subscribe us. please comment below to ask any questions related to this blog post.